When I was pregnant with D, I discovered fairly on that sleeping properly was a thing of the past. People tell you its all about preparing for baby's arrival but I have to say, I slept better the first month after he was born than the three months before he was. After that... well... month 2 to 5 were... interesting. Anyway, back to pregnancy. Night-times with D were very disrupted. He induced the worst heartburn that I've ever had. I was one of those people swigging Gaviscon in the middle of the night. Eggy is a little kinder although she has had her moments - mostly in the second trimester but usually in the day. What she's not been so good for is the weird muscular problems I've had. While D gave me some back problems towards the end, Eggy's been harder on my legs weirdly. I also struggle with the whole sleeping on my side thing. I like to sleep on my front or my back. I wake up in the middle of the night back on my back and feel rather annoyed with myself. With D, I got a Dream Genii pillow to help. I loved it - I found my knees being together the strangest sensation and this provided support there. It also stopped my rolling back. Unfortunately it had its problems. When I came to wash the pillow case it was a nightmare to get off of the inner. It washed well but then getting it back in was close to impossible. No matter how much plumping I did this time around it was just a bit flat, a bit bashed about in the places where I wanted it to be a bit firmer and a bit misshapen from being taken out and put back into the cover. I also didn't find it all that helpful as a nursing pillow. Again, it just didn't feel firm enough and it didn't really provide as much back support as I needed. I think (there is an element of haziness in those days four years ago...) that I didn't really use it very much at all for that. 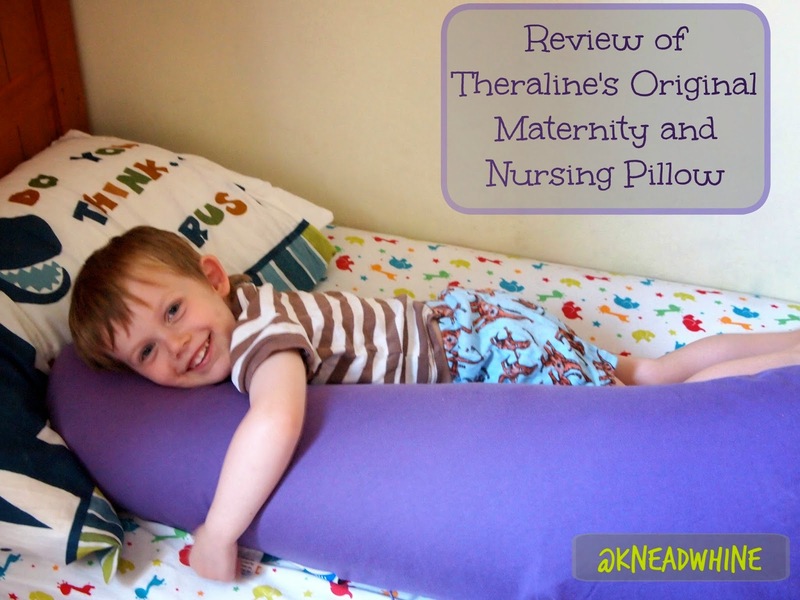 So when John Lewis and Theraline got in touch to offer a Theraline maternity and nursing pillow for review, I was super keen. Within one night, I was so sold on it that I threw the Dream Genii out. The Theraline is filled with beads which means that squishing problem will never happen. It doesn't have that back support but I just don't need it as it is so comfortable I'm waking up in the same position as I fell asleep in. I've used it for the last five nights and I've slept SO much better than the time before. I even managed to sleep through one night which hasn't happened in a few months. The issues I was having with my leg seem to have disappeared; I'm sure this was in part as a result of the pillow. I've also tested removing the outer for washing (for testing purposes) and it is easy as pie. The zip is long, meaning no struggle with removing the filling. As a result of the micro beads, it's fairly easy to get it back in again - and have the pillow even. I also think it will be helpful when Eggy arrives - it's firm enough for me to be happy to use it for nursing. The Theraline comes in a range of great colours - I was sent the purple one and I really like it. Although Dream Genii does come with different options for the cover now it wasn't the case when I bought it in 2010 and it was a plain white. It's nice to have something a bit more colourful. There are many other options too, I love the beach theme and the donkey cover of the printed options. I'm very impressed with the Theraline - it's firm, it's comfortable, it's easy to wash and I'm sure it would be far more useful after pregnancy (or should there be subsequent pregnancies!) than the Dream Genii was. I cannot recommend it highly enough. Neither can D, who thinks it probably ought to belong to him! Although I was sent this product for review, the words and review are entirely my own.